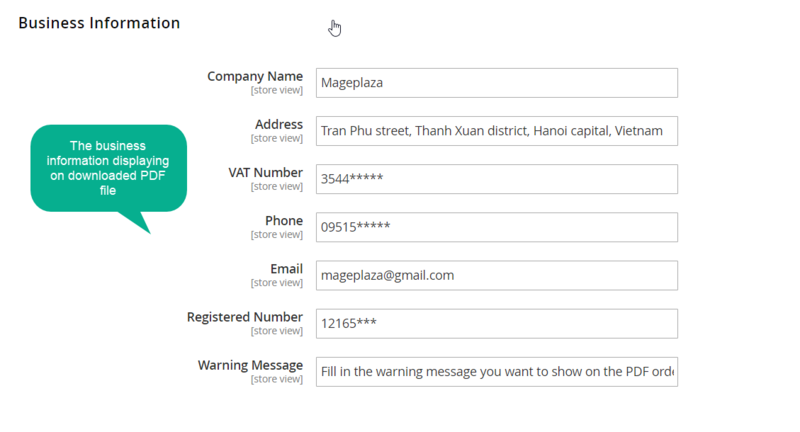 Share Cart Extension by Mageplaza allows customers to share their shopping cart with friends and family. This is a useful way to promote store’s products via the existing users efficiently and improve stores’ conversion rate. A customer is really satisfied when he has just made the purchase from a store and wants to share with the friends quickly. Instead of chatting by words, capturing images of images of the items, it is much easier and more convenient to copy all the shopping carts and send to his friends and family as a bright recommendation. There is a demand that customers would like to download and save the purchasing information as PDF file in their PCs for various aims. They can review and store their purchasing history or attach this file for sharing later. The sharing of the shopping experience from customers is an effective way to promote a store’s products quickly and efficiently. A person tends to be much more trusted on a product or a brand when he/she receives the recommendation from the friends or the family. Accordingly, the conversion rate from sharing shopping cart will increase significantly and the store brand is also promoted reliably. 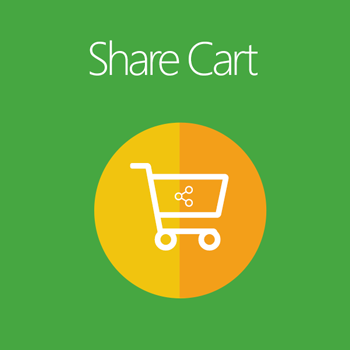 Share Cart module helps store owners add an extra button named “Share cart” during customers are processing their purchasing. The button appears on Minicart section and Shopping Cart Page. Clicking on this button is the fastest way to copy their shopping cart’s link and paste to the destinations for sharing with friends easily. When the next customers click on the share link, their shopping cart will be automatically updated similarly. 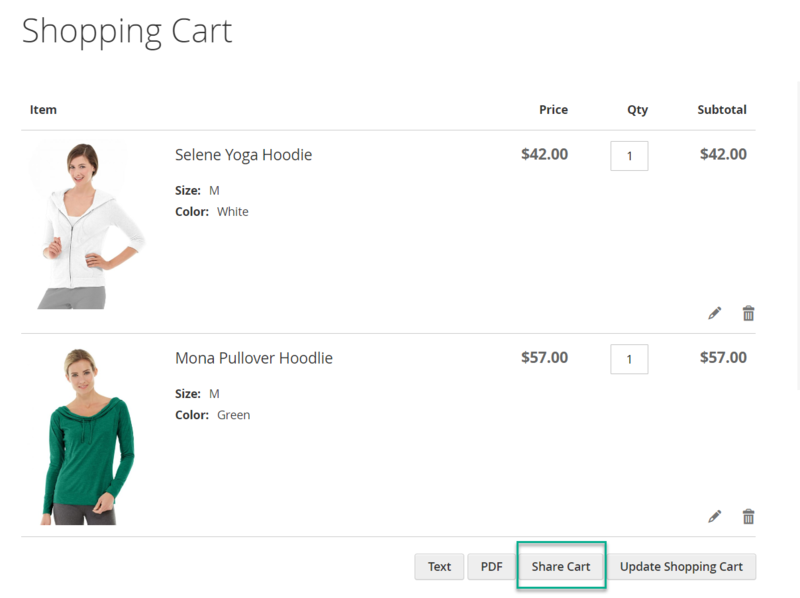 For the cart with several different items, Share Cart extension allows customers to view the summary easily with another extra button - Text. 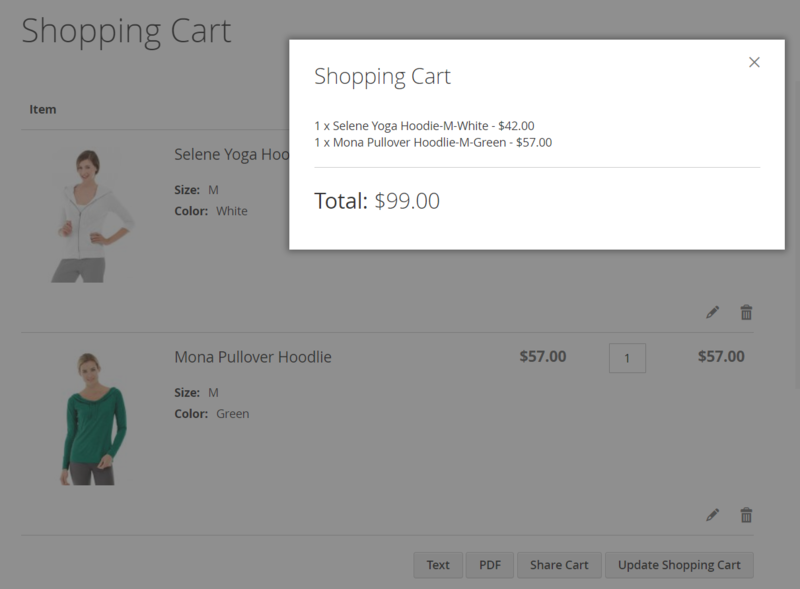 When a customer clicks on the Text button on Shopping Cart Page, a text pop-up which works as a purchasing summary box will appear. This button looks simple but useful to help customers can take an overall review clearly about their chosen items, each item price, each item quantity and cart total. Click update button when making any changes to purchasing items. The extension is well responsive with both desktop and mobile devices. 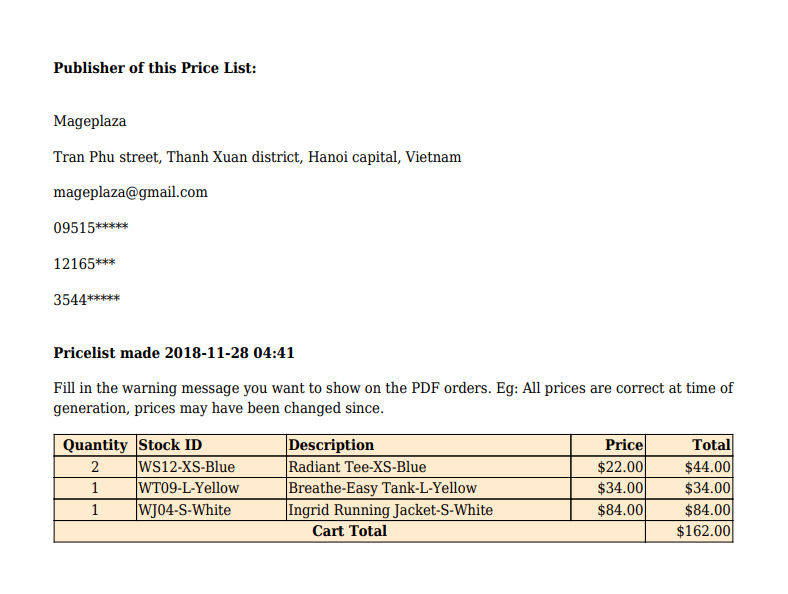 filter_drama How can customers use share button? Customers only need to click on the button and paste the automated URL to anywhere they want to share. filter_drama Where does the share button appear on site? Share button displays on Minicart and Shopping Cart page. filter_drama What is the difference between Text button and PDF button? For display, text button will show a pop-up while PDF button is for downloading. For information, Text button only displays chosen items while PDF file adds more the store’s information. filter_drama How can I tell the customers that the price can be changed later? Please leave a message on Warning Message box from the admin backend. filter_drama Can I add the time when a customer downloads the PDF file? Yes, absolutely. Please enable the adding timestamp suffix from the admin backend. "A customer is really satisfied when he has just made the purchase from a store and wants to share with the friends quickly." This point is important!! If you have a Magento store, you need this extension. Thank you so much. Very useful extension. The module has helped to drive potential customers to the store!. Thank you again! This extension is simple to install and configure in the latest Magento. The cart can be shared and simple promotions for other to make sales in our store. I'm totally in love with Share cart extension. Not only it is free but it also improves my store revenues considerably. Keep up the good work !!! Not sure what to buy? Well, ask your friends. They will tell you if your dress is a perfect combination or not. Easy share chart contents with this addons make dress store earn more money. Good job.